Jesus, that was a depressing read. Someone piss in your cornflakes this morning? I've seen stroke patients with a more positive outlook. You want some meds? Yes, Michigan sucked the last few years. Yes, Denard was its saving Grace. But, the last two years have hardly been a loss. While anyone would prefer to see Denard finish his home career at his preferred position, he still was on he field racking up almost 100 yards as a part time "something back". The game was his early audition for the type of role he'd play in the pros. And, there's no reason to think he'll be out of football in a couple of years. While it's possible, there are players like Randle El that had decent careers. Personally, I thought he game demonstrated a perfect transition of power into what appears to be a promising Devin Gardner era. It was a little bittersweet with Denard relegated to using his legs alone, but I wouldn't walk into oncoming traffic about it. Lighten up, Francis. - has 17 career games with three-plus total touchdowns (5 - 3 times, 4 - 7 times, 3 - 7 times). Mark Weisman's career at Iowa is a flash in the pan. Hell, even Roy Roundtree's 2010 season was flash in the pan. 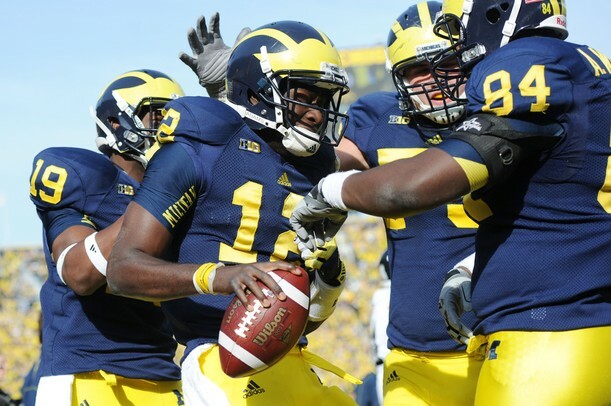 But Denard has one of the most accomplished careers of any athlete to ever wear the winged helmet. The only thing that stood between Denard and the possibility of a Legends jersey was a good defense in 2010.